Long lasting heat and even heat distribution. 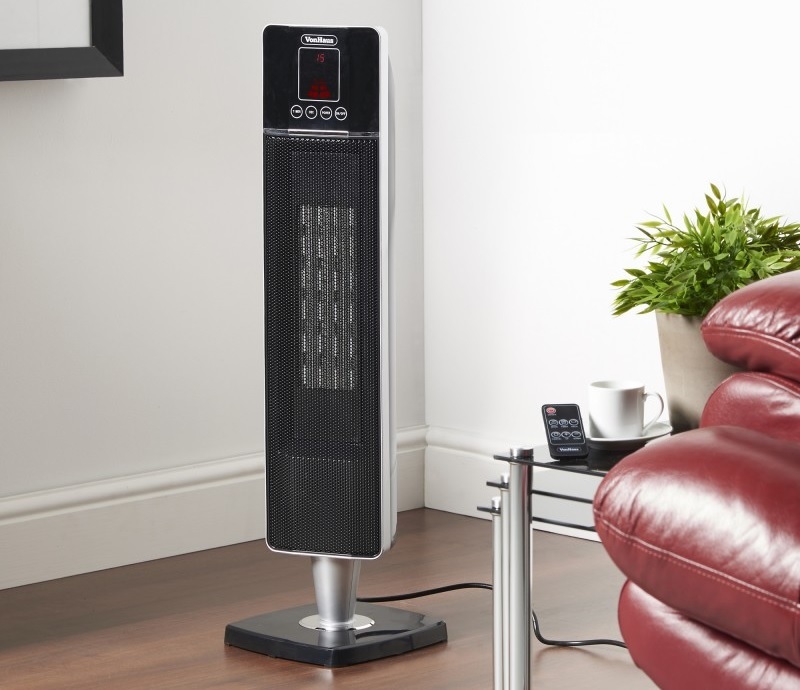 Quicker and more efficient heating, and covering a bigger space than a portable fan heater, a ceramic fan tower heater is the answer for heating up medium sized rooms. They can oscillate to cover more areas and have remote controls for convenience. Here are 5 of the best ceramic fan tower heaters for 2018 to keep you warm this winter. 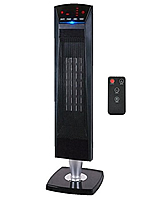 Why a Ceramic Fan Tower Heater? As the days get colder, we’re all beginning to turn our heating on to get cosy and warm. However, with the costs of gas and electricity bills rising, more people are opting to pile on the layers of clothing instead of using the heating. Ideal for heating one room or giving extra heat without the need to turn on the heating for the whole house so no unoccupied room is unnecessarily heated up. Heating can be personalised to just one spot – on you! 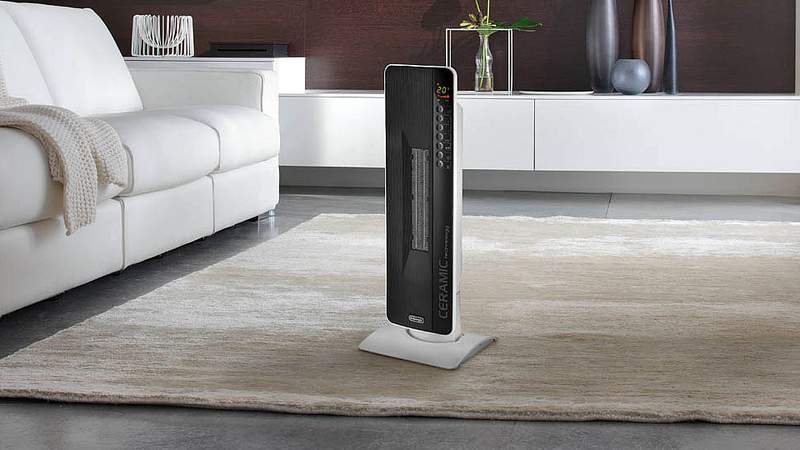 A ceramic fan tower heater can oscillate to eject heat in its surrounding space. What is a Tower Heater? 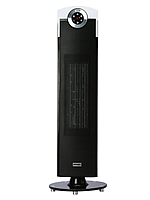 Tower heaters are typically designed as cylindrical or rectangular in shape, upright and portable. Rarely any are powered by fuel in the UK. The ones here are mainly powered by electricity. Independent Fan Heaters – Fan blades are installed within a casing which is heated up when the blades turn to blow air onto an electrical heat source. The hot air is blown out through the vents in the casing to warm up the air inside a room. Ceramic Fan Heaters – These have wire coils going through a ceramic plate and it heats up when a current is passed through the coils. The ceramic plates absorbs the heat which is then directed outwards into the air via a fan. This makes them excellent electrical insulators because of the well designed thermal conductivity. They also generate heat more quickly and efficiently, thus saving energy costs. A touch control panel with menu and setting options instead of traditional buttons or dials. 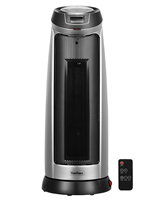 It also shows off its hi tech enhancement setting it apart from the old style tower heaters. 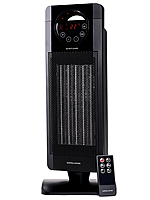 Dimplex Studio G ceramic tower fan heater. Safer to Use – The heat output in ceramic tower heaters are self-regulating and the enclosures for tower heaters are made with cool to touch materials so the risk of burning fingers on it is reduced. Heats Up Faster – It takes just a few minutes to provide warmth to a large room. You will barely have time to shiver from the cold! Even Heat Distribution – Tower heaters will usually have an oscillation feature to ensure each part of a room is heated up so no one will feel cold no matter how far from the heater they are sat. A few of the best tower heaters have the option to oscillate at a 360 degree range which makes it perfect for very large areas. Tip Over Protection – There’s usually a wide and sturdy base attached to the bottom of tower heaters due to its height. This will prevent it from falling down if someone bumps into it. Some will have an automatic shut off installed too if the tower heater does fall over. Longer Lasting Heat – Whether it’s a ceramic tower heater or tower fan heater, both will keep rooms heated for a longer time after it’s been switched off because it takes a longer time for them to cool down. 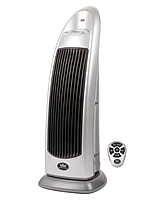 This makes it more energy efficient than other types of freestanding heaters as well. Background Heating – Tower heaters will also provide some heat to the surrounding areas of the room even when it’s directed in one area. Takes Up Less Floor Space – Due to the standing upright design of tower heaters, they are smaller so can even fit in small rooms. Other heaters can take up a lot of space despite being a slim panelled radiator. 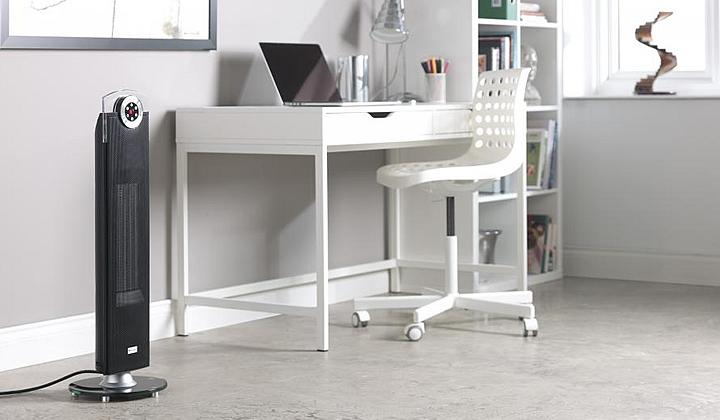 Easy to Store Away – Can fit into the corner of the room or a narrow gap when it’s no longer needed. No Blinding Glow – Some portable heaters such as halogen heaters can give off a bright glow that’s too much for the eyes to handle. Ceramic tower heaters and tower fan heaters have no glowing parts installed. Energy Saving – Because of its combination of using a fan and ceramic heating element to generate heat more quickly and efficiently. Don’t cover with clothing – as with all portable heaters, don’t hang clothing on the heater or near it as there’s a risk of fire. There are many tower heaters to choose from, but not all of them are effective or safe. It’s a good idea to start with our list of the best ceramic tower heaters above, as they’ve garnered many positive reviews and a good reputation. One things for sure, you don’t want to go cold this winter!